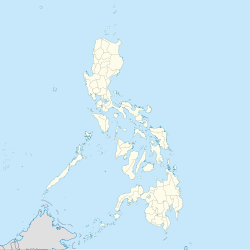 Albuera, officially the Municipality of Albuera, is a 3rd class municipality in the province of Leyte, Philippines. According to the 2015 census, it has a population of 46,332 people. On November 4, 2016, 1st-term Albuera Mayor Rolando Espinosa Sr., who was linked to illegal drugs through his son and alleged drug lord Rolan "Kerwin" Espinosa, was shot dead inside his prison cell at the Baybay City Sub Provincial Jail. Espinosa was replaced by his vice mayor Rosa Meneses while councilor Sixto dela Victoria filled in as vice mayor. In the 2015 census, the population of Albuera, Leyte, was 46,332 people, with a density of 150 inhabitants per square kilometre or 390 inhabitants per square mile. SDMF Skills Development for Maintenance and Fabrication and Technical Services, Inc.